On a rainy afternoon (one of many recently), Grampy, Grammy and Camzilla were sitting at the kitchen table. Grammy was having her coffee, Grampy was drawing a moose and Camzilla was painting, her paper, her hands, and her face. But not without asking first, she is always polite and considerate, so how could she be denied this simple pleasure, and of course Grammy said yes. And so we had a red faced granddaughter. She was also painting her fingernails red and then turning her hand upside down on the paper and painting with them. Who said we had to put paint on the paper with a brush. 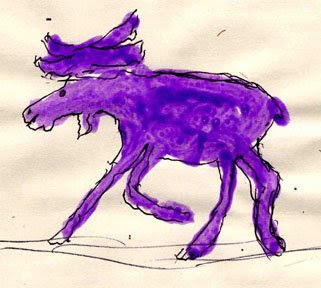 When Grampy asked her what color he should paint the moose, Camzilla said purple, so purple it is. Not only did she paint her hands, but Grampy's and Grammy's as well. She was very excited when she painted Grammy's hand and the paint was brown, " I made brown, I made brown!!" And thus she discovered that mixing yellow and purple make brown. Whenever she is around there are many moments of discovery for her and for us.